\"Western yellowjackets (Vespula pensylvanica) are predators, feeding on a wide range of invertebrate taxa, with great potential for negative impact on the native fauna in insular habitats.\n\"
Vespula pensylvanica are striking yellow and black wasps measuring approximately 1.5cm in length (Gruner & Foote, 2000). Workers and queens have a distinctive complete yellow eye ring around each compound eye. However at least one other yellowjacket, Vespula sulphurea also has this eye ring. V. sulphurea can be distinguished from V. pensylvanica by two distinctive yellow longtitudinal stripes on its thorax (R. Vetter, pers. comm). It looks like New Zealand Vespula vulgaris is not the same as the US species Vespula vulgaris (on the basis of preliminary molecular work), (Beggs, pers.comm., 2003). The nests of Vespula pensylvanica are mostly subterranean, often in old rodent burrows. The nests can be large, up to 11,000 cells. This species takes live prey as well as scavenging. V. pensylvanica becomes a pest in the Northwest U.S. where there are outbreaks of high populations every few years (Source: Matthew P. Kweskin). \"Climate is a major constraint on yellowjacket reproductive behaviour; cold weather depletes normal food supplies, resulting in a reduction of colony individuals during cold winter months. However, in Hawai‘i with its warmer year-round climate, colonies appear to enlarge during warm winter months causing population explosions in areas it has invaded.\"
Vespula pensylvanica has an affinity to scavenge. In addition, it tends to nest in the open near recreational areas, and is a common visitor to picnic areas and garbage receptacles. Its workers have been known to forage up to 1800 feet from the nest, but the normal foraging range is about 1100 feet. Principal source: Matthew P. Kweskin, Evergreen State College, WA. 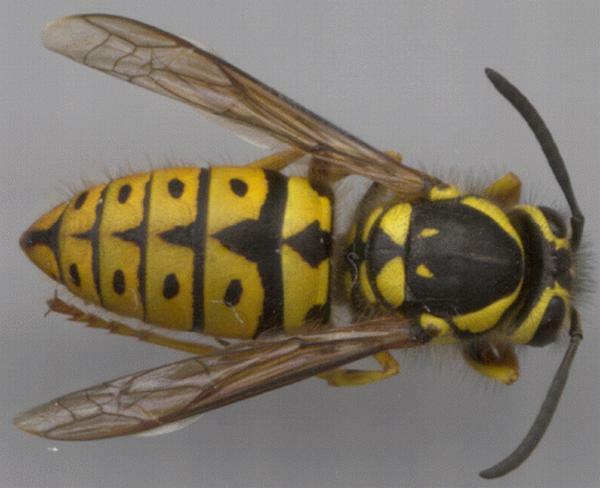 Recommended citation: Global Invasive Species Database (2019) Species profile: Vespula pensylvanica. Downloaded from http://www.iucngisd.org/gisd/species.php?sc=174 on 21-04-2019. Wasps impact in a range of human activities and values, from conservation, forestry, beekeeping and horticulture sectors to human-health. Wasp stings are painful at best, and life-threatening at worst. A small proportion of the population will have a severe allergic reaction (called anaphylactic shock), which can be fatal unless treated promptly (Landcare Research 2007). In forests wasps may eat huge numbers of native insects and consume large quantities of sugary honeydew. By eating so much, wasps take potential food sources away from native animals and disrupt the natural food chain and ecosystem cycling of the forest (Landcare Research 2007). Western yellowjackets are predators which prey on a wide range of invertebrate taxa. Their great potential for negative impacts on native invertebrate is evidenced in Hawaii, where they threaten endemic invertebrates (which have evolved in the absence of wasps and without any anti-predator adaptations). Direct reduction of native arthropod species diversity and abundance may lead to other problems, such as a decrease in food availability for native forest birds and pollinators for native plants (Gruner & Foote, 2000). Wasps bring with them a financial burden too. They are economic pests of primary industries such as beekeeping, forestry and horticulture (Beggs 2000). Wasps totally destroy or seriously affect 10% of beehives, which translates to a significant financial loss (Clapperton et al., 1989). Beehives are often placed near honeydew forests or other unique sources of nectar to produce strong-flavoured honey. However, wasps can reduce honey production by reducing nectar and honeydew supplies and cause honeybees to stay home to conserve energy and protect their hive from raiding wasps (Landcare Research 2007). Preventative: After a 1988 study which found 90.2% of Christmas trees imported into Hawaii contained live insects, the Hawaii Department of Agriculture (HDOA) imposed a zero tolerance for all live yellowjacket and hornet queens. A tree-shaking certification programme was established which required exporters to shake trees after harvest to remove insects via manual shaking of 10% of trees in the presence of an agricultural inspector, or mechanical shaking of 100% of trees with no inspection requirement. Hollingsowrth et al. (2009) assessed the efficacy of the shaking programme and found that mechanical shaking was significantly more effective than manual shaking, but that both techniques were inadequate for removal of yelllowjacket queens. In the case of the mechanical shaking, it may not prove the inadequacy of the mechanical shaking procedure, but rather that the procedures after shaking may have allowed trees to become reinfested, or that shaking was insufficient. Shaking effectiveness is influenced by design of the shaker, weight of the tree and shaking time. Trees should be shaken just before loading trees for export. However, although improved shaking practices are an important first step to reducing quarantine risk, they are unlikely to solve the problem completely. The authors recommend an integrated approach that includes the application of a preharvest permethrin spray combined with thorough mechanical shaking just before loading Christmas trees into containers(Hollingsworth et al., 2009). Monitoring: In Hawaii populations are monitored closely to aid in future analyses of distribution. This is accomplished using “yelllowjacket inns” baited with heptyl butyrate chemical attractant (Gruner & Foote, 2000). Directions for use can be found in Management Strategies for Western Yellowjackets in Hawaii. Chemical: \"Almost as soon as the 1977 population was discovered, nest eradication and/or control programmes were initiated on various islands in Hawai‘i to attempt to control the yellowjacket. The toxicant bendiocarb, used for nest eradication, is not registered in the USA for use in agricultural situations, so its implementation had to be outside of agricultural fields. Chang (1988) discusses the use of toxic baiting in the control of yellowjackets. His results showed that the most effective combination of bait and chemical toxicant was 0.5% microencapsulated diazinon mixed with canned Figaro brand tuna cat food. Amidino-hydrazone in a similar bait mix was also effective, but less so than than diazinon mix. Dispenser colour for the bait also proved critical, the preferred colour of bait dispenser being translucent white.\"
Informations on Vespula pensylvanica has been recorded for the following locations. Click on the name for additional informations. Chang, V. 1988. Toxic baiting of the western yellowjacket (Hymenoptera: Vespidae) in Hawaii. Journal of Economic Entomology 81: 228�35. Gambino, P. and Loope, L. L. 1992. Yellowjacket Vespula pensylvanica biology and abatement in the National Parks of Hawaii. Cooperative National Park Research Study Unit Technical Report 86: 1�41. Hollingsworth, R.G., Chastagner, G.A., Reimer, N.J., Oishi, D.E., Landolt, P.J. & Paull, R.E. (2009). Use of Shaking Treatments and Preharvest Sprays of Pyrethroid Insecticides to Reduce Risk of Yellowjackets and Other Insects on Christmas Trees Imported Into Hawaii. Journal of Economic Entomology 102(1): 69-78. Landcare Research. 2007a. Home > Research > Biodoversity and Conservation > Invasive invertebrates > Identification & surveillance. Landcare Research. 2007d. Home > Research > Biodoversity and Conservation > Invasive invertebrates > Wasps > Wasp Control. Nishida, G. M. and Evenhuis, N. L. 2000. Arthropod pests of conservation significance in the Pacific: A preliminary assessment of selected groups. In Invasive Species in the Pacific: A Technical Review and Draft Regional Strategy. South Pacific Regional Environment Programme, Samoa: 115-142. Summary: Discusses over a dozen of the worst arthropod pests in the South Pacific, with particular emphasis on ants and their control and management. Gambino, P. 1991. Reproductive plasticity of Vespula pensylvanica (Hymenoptera: Vespidae) on Maui and Hawaii Islands, USA. New Zealand Journal of Zoology 18: 139�49. Global Biodiversity Information Facility (GBIF), 2009. Vespula penyslvanica. Landcare Research. 2007c. Home > Research > Biodoversity and Conservation > Invasive invertebrates > Wasps > Impact in New Zealand. Williams, F. X. 1927. Notes on the habits of bees and wasps of the Hawaiian Islands. Proceedings of the Hawai ian Entomological Society 6: 425�64. Graduate Researcher, University of California, Berkeley.